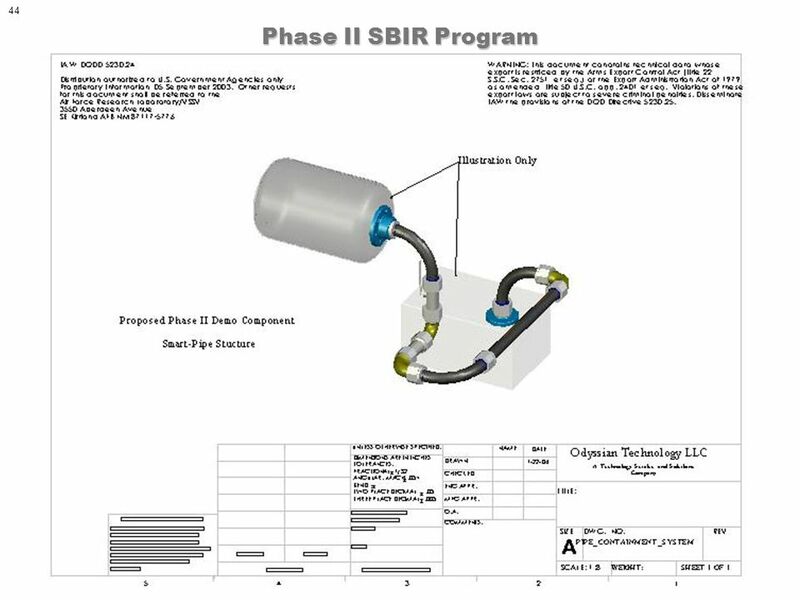 1 DISTRIBUTION SBIR Data Rights. Disseminate IAW DODD 5230.24, DODD 5230.25. Distr. Authorized to U.S. Government Agencies Only. Export is restricted. 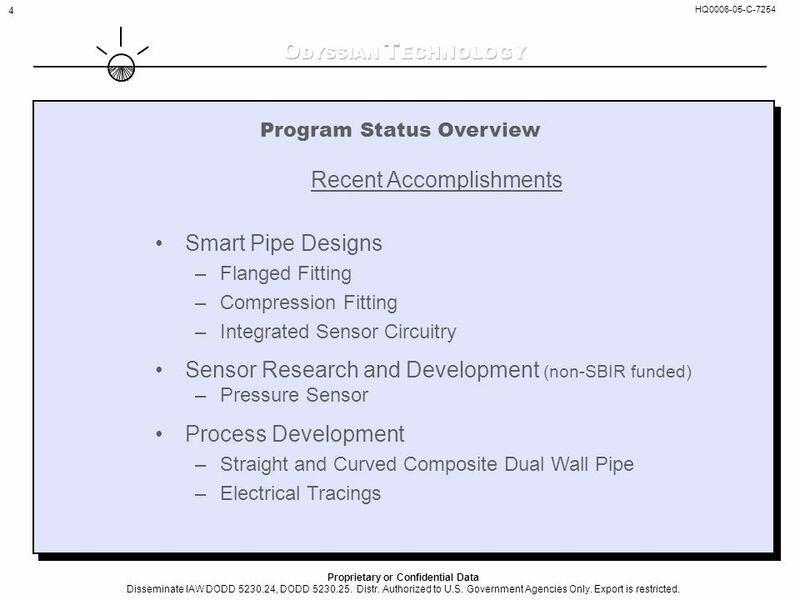 4 4 Program Status Overview Recent Accomplishments Smart Pipe Designs –Flanged Fitting –Compression Fitting –Integrated Sensor Circuitry Sensor Research and Development (non-SBIR funded) –Pressure Sensor Process Development –Straight and Curved Composite Dual Wall Pipe –Electrical Tracings HQ0006-05-C-7254 Proprietary or Confidential Data Disseminate IAW DODD 5230.24, DODD 5230.25. Distr. Authorized to U.S. Government Agencies Only. Export is restricted. 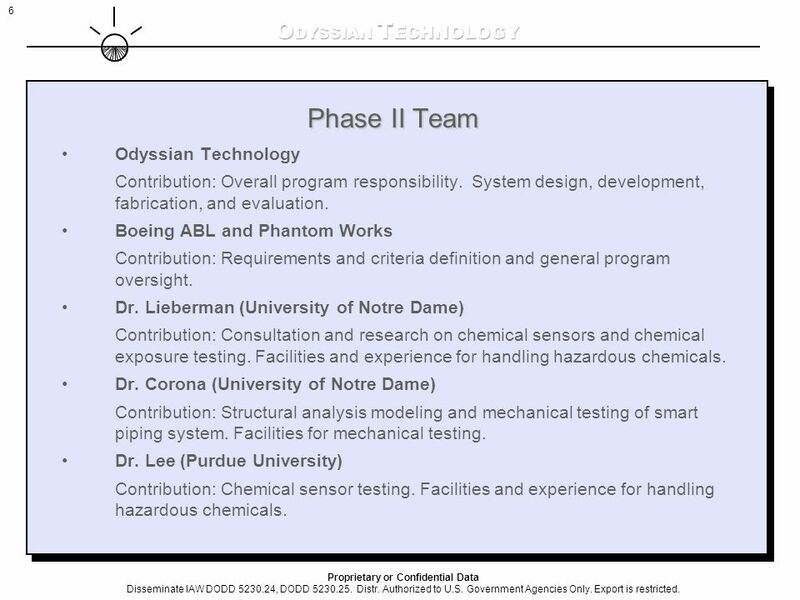 6 6 Phase II Team Odyssian Technology Contribution: Overall program responsibility. 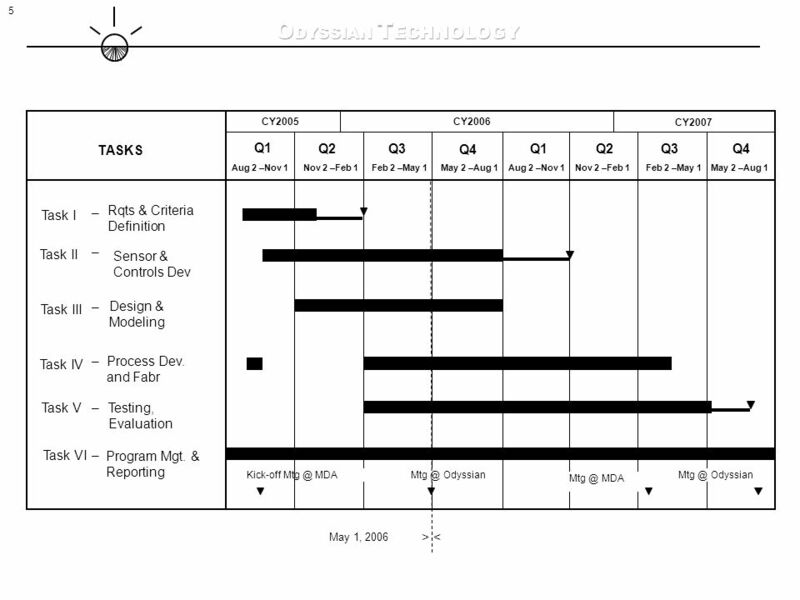 System design, development, fabrication, and evaluation. 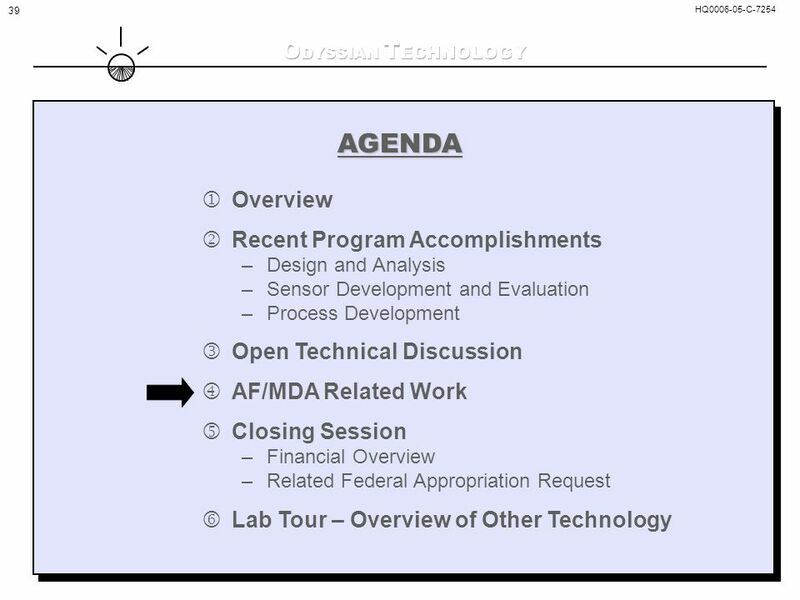 Boeing ABL and Phantom Works Contribution: Requirements and criteria definition and general program oversight. 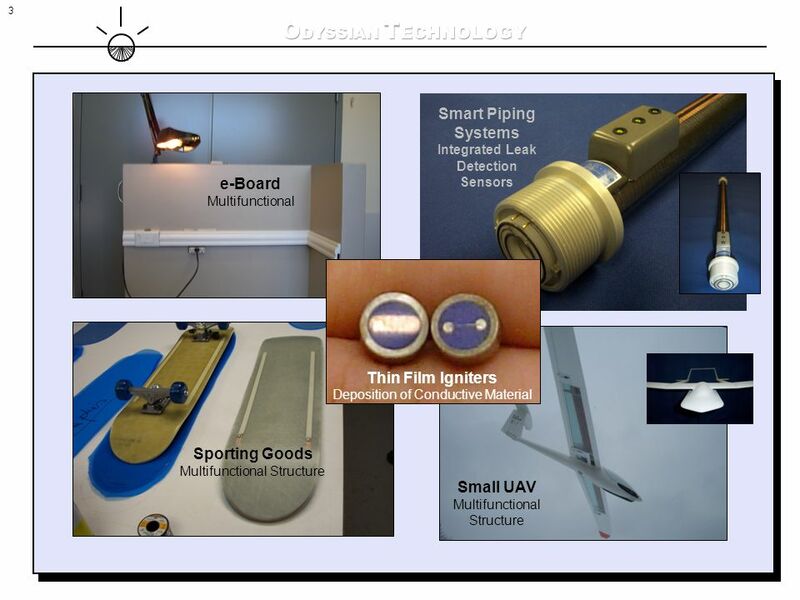 Dr. Lieberman (University of Notre Dame) Contribution: Consultation and research on chemical sensors and chemical exposure testing. Facilities and experience for handling hazardous chemicals. 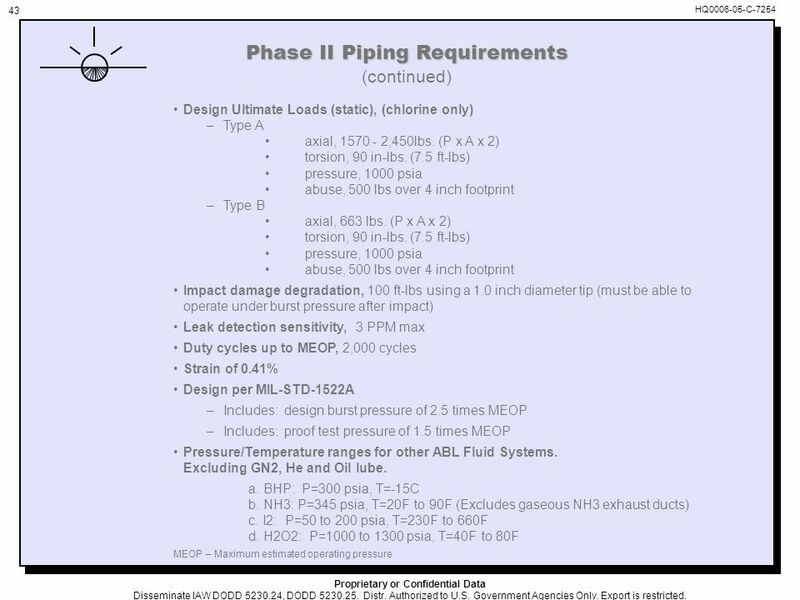 Dr. Corona (University of Notre Dame) Contribution: Structural analysis modeling and mechanical testing of smart piping system. Facilities for mechanical testing. 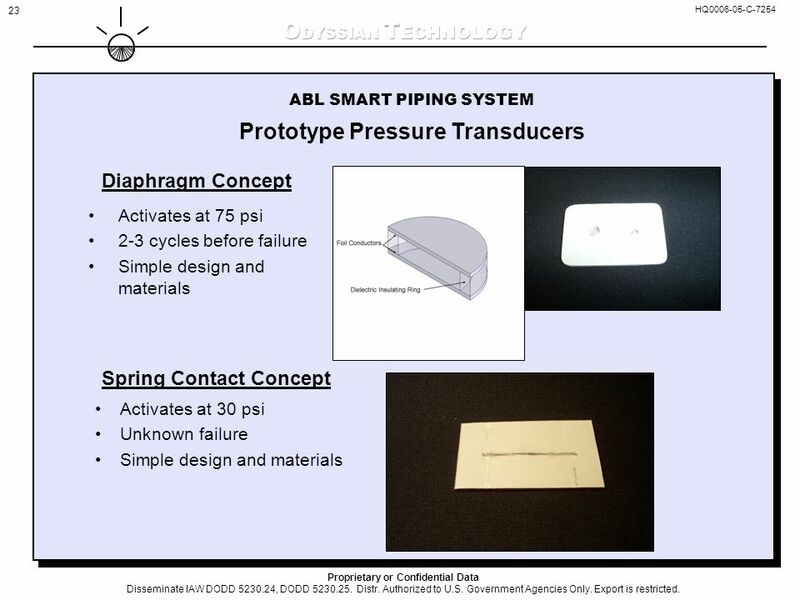 Dr. Lee (Purdue University) Contribution: Chemical sensor testing. Facilities and experience for handling hazardous chemicals. 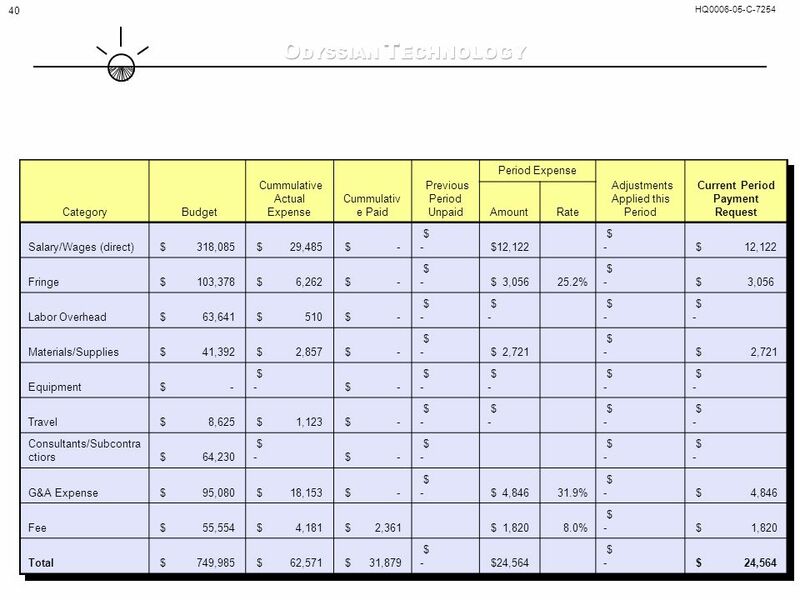 Proprietary or Confidential Data Disseminate IAW DODD 5230.24, DODD 5230.25. Distr. 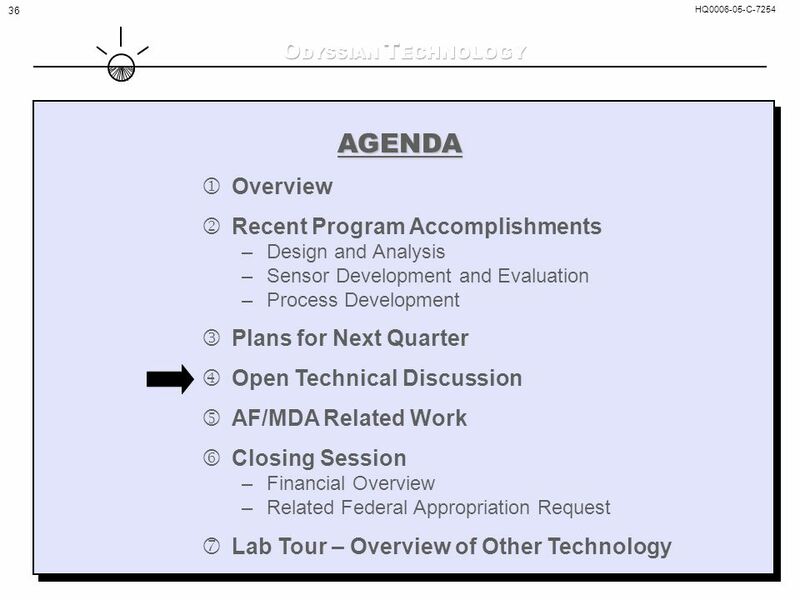 Authorized to U.S. Government Agencies Only. Export is restricted. 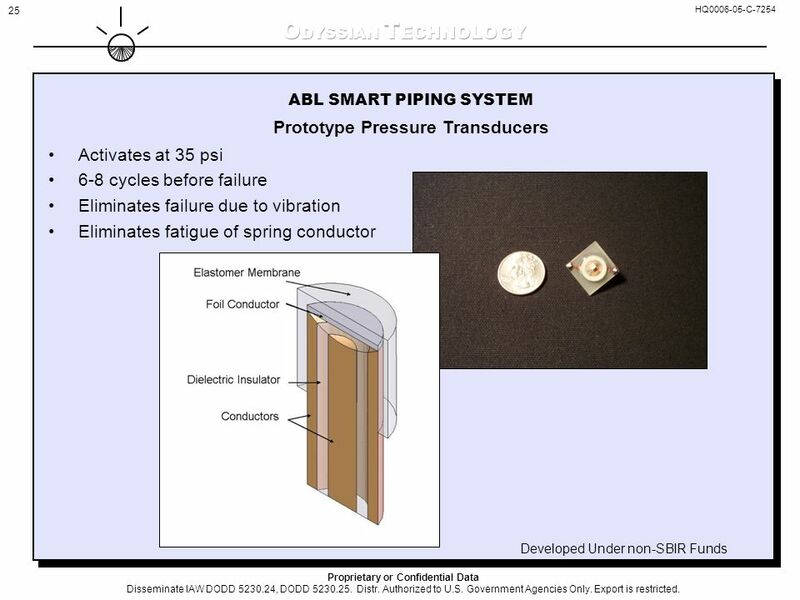 8 8 ABL SMART PIPING SYSTEM Task III: Design and Modeling Positive Electrical Pin (for shown circuit) Common GroundChlorine Sensor (Tin Fuse) Copper foil conductor Secondary O-ring Positive Electrical Pin (for circuit on other side of seal) Primary O-ring Threaded Pipe Design HQ0006-05-C-7254 Proprietary or Confidential Data Disseminate IAW DODD 5230.24, DODD 5230.25. Distr. 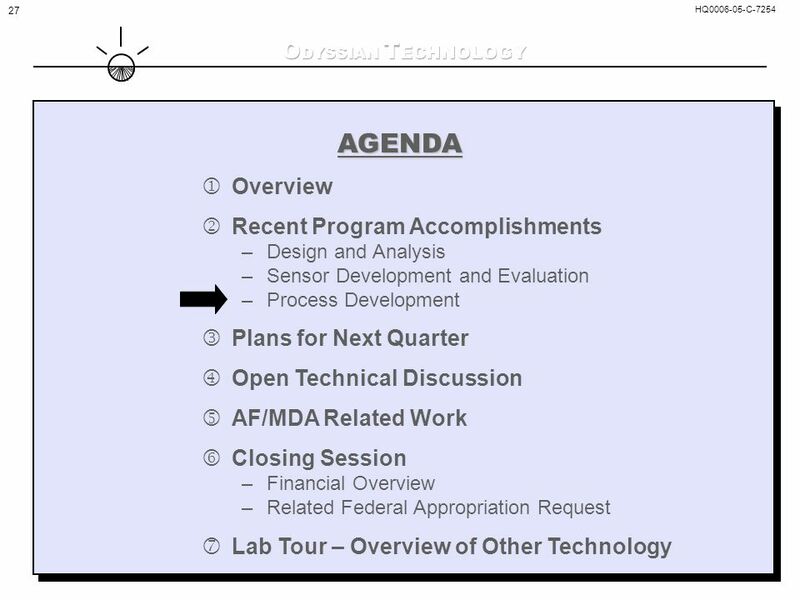 Authorized to U.S. Government Agencies Only. Export is restricted. 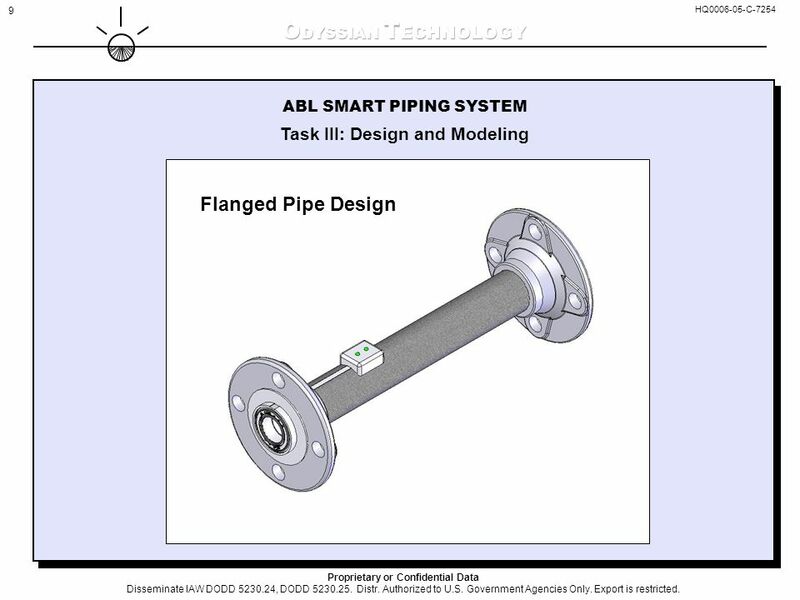 9 9 ABL SMART PIPING SYSTEM Task III: Design and Modeling Flanged Pipe Design HQ0006-05-C-7254 Proprietary or Confidential Data Disseminate IAW DODD 5230.24, DODD 5230.25. Distr. Authorized to U.S. Government Agencies Only. Export is restricted. 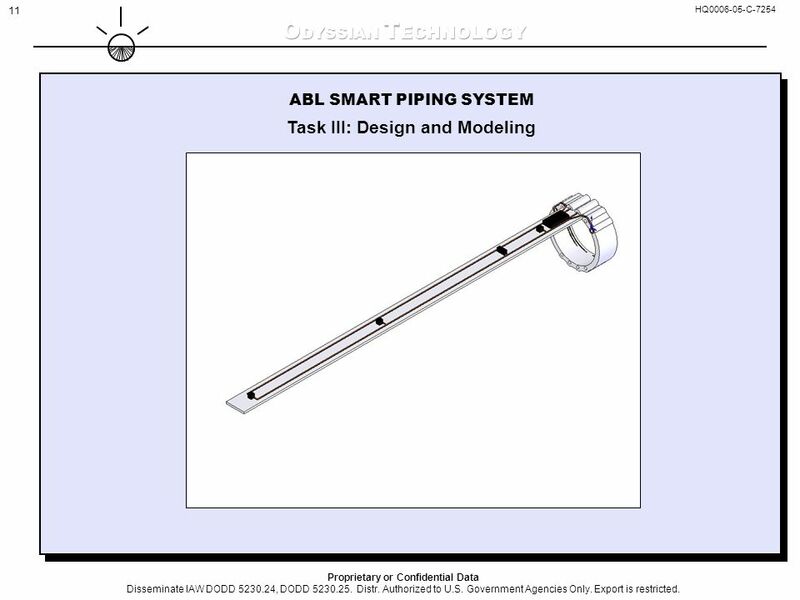 10 10 ABL SMART PIPING SYSTEM Task III: Design and Modeling HQ0006-05-C-7254 Proprietary or Confidential Data Disseminate IAW DODD 5230.24, DODD 5230.25. Distr. Authorized to U.S. Government Agencies Only. Export is restricted. 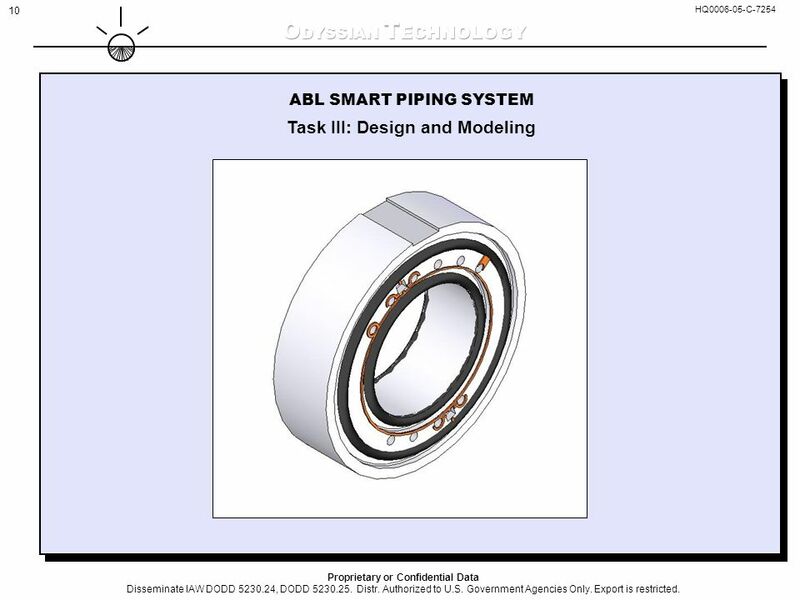 11 11 ABL SMART PIPING SYSTEM Task III: Design and Modeling HQ0006-05-C-7254 Proprietary or Confidential Data Disseminate IAW DODD 5230.24, DODD 5230.25. Distr. Authorized to U.S. Government Agencies Only. Export is restricted. 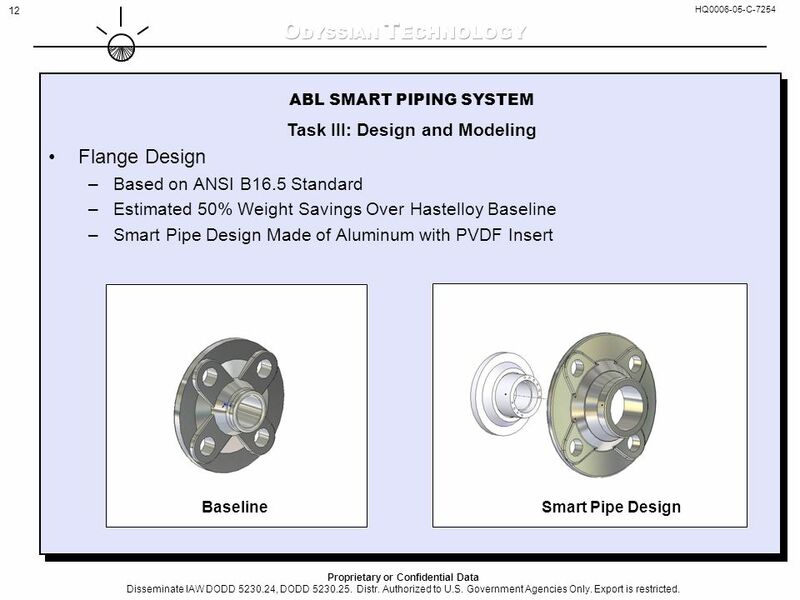 12 12 ABL SMART PIPING SYSTEM Task III: Design and Modeling Flange Design –Based on ANSI B16.5 Standard –Estimated 50% Weight Savings Over Hastelloy Baseline –Smart Pipe Design Made of Aluminum with PVDF Insert BaselineSmart Pipe Design HQ0006-05-C-7254 Proprietary or Confidential Data Disseminate IAW DODD 5230.24, DODD 5230.25. Distr. Authorized to U.S. Government Agencies Only. Export is restricted. 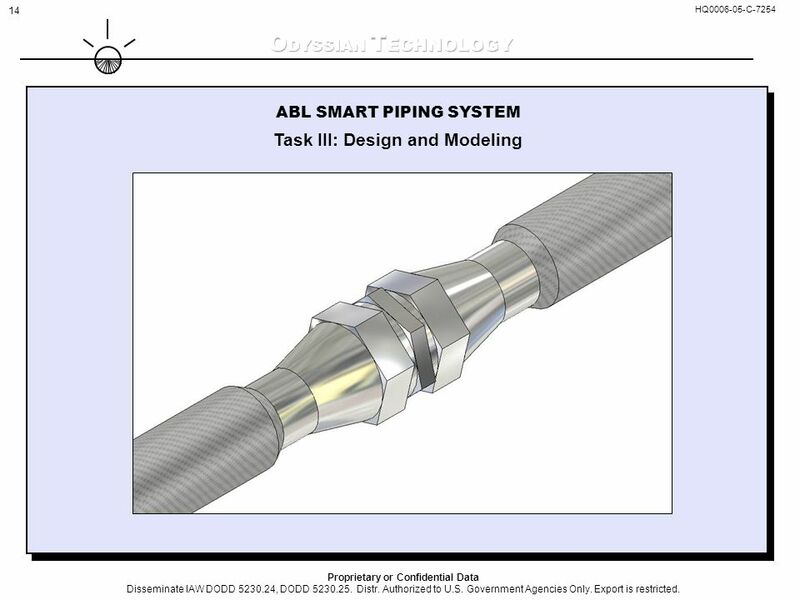 13 13 ABL SMART PIPING SYSTEM Task III: Design and Modeling Curved Pipe –Braided or Wound –Mates to other Smart Pipe Fittings –Lighter Weight than Elbow Joints HQ0006-05-C-7254 Proprietary or Confidential Data Disseminate IAW DODD 5230.24, DODD 5230.25. Distr. Authorized to U.S. Government Agencies Only. Export is restricted. 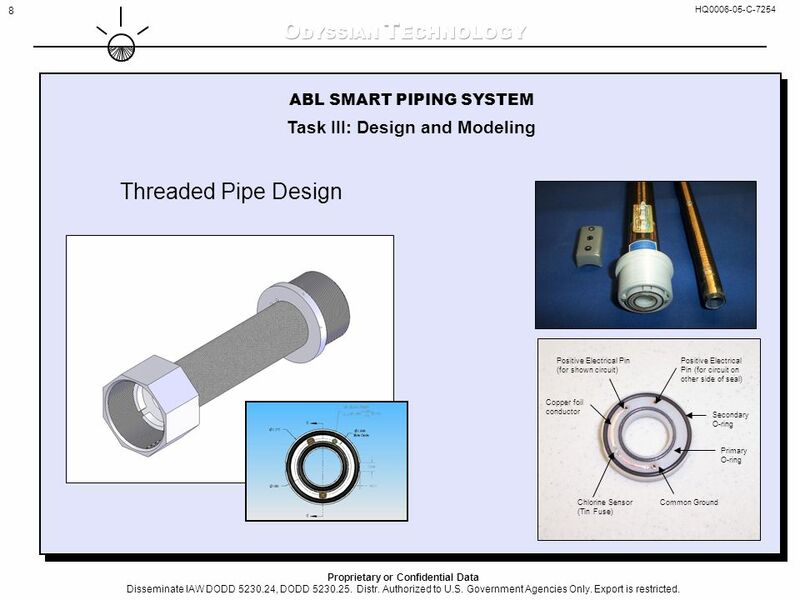 14 14 ABL SMART PIPING SYSTEM Task III: Design and Modeling HQ0006-05-C-7254 Proprietary or Confidential Data Disseminate IAW DODD 5230.24, DODD 5230.25. Distr. Authorized to U.S. Government Agencies Only. Export is restricted. 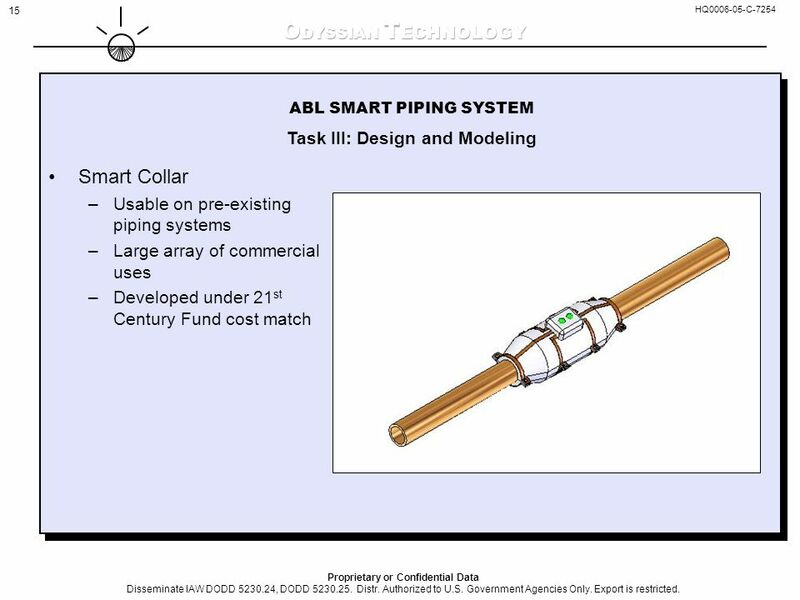 15 15 ABL SMART PIPING SYSTEM Task III: Design and Modeling Smart Collar –Usable on pre-existing piping systems –Large array of commercial uses –Developed under 21 st Century Fund cost match HQ0006-05-C-7254 Proprietary or Confidential Data Disseminate IAW DODD 5230.24, DODD 5230.25. Distr. Authorized to U.S. Government Agencies Only. Export is restricted. 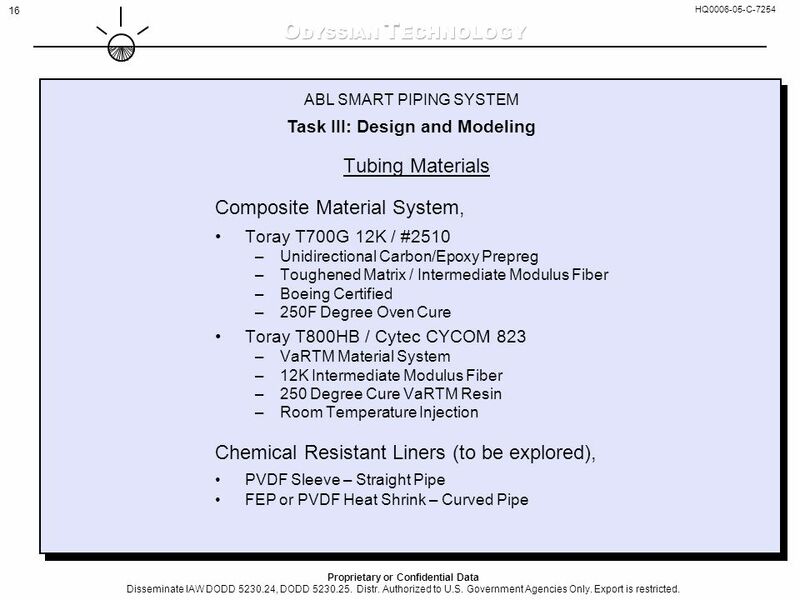 16 16 ABL SMART PIPING SYSTEM Task III: Design and Modeling Tubing Materials Composite Material System, Toray T700G 12K / #2510 –Unidirectional Carbon/Epoxy Prepreg –Toughened Matrix / Intermediate Modulus Fiber –Boeing Certified –250F Degree Oven Cure Toray T800HB / Cytec CYCOM 823 –VaRTM Material System –12K Intermediate Modulus Fiber –250 Degree Cure VaRTM Resin –Room Temperature Injection Chemical Resistant Liners (to be explored), PVDF Sleeve – Straight Pipe FEP or PVDF Heat Shrink – Curved Pipe HQ0006-05-C-7254 Proprietary or Confidential Data Disseminate IAW DODD 5230.24, DODD 5230.25. Distr. Authorized to U.S. Government Agencies Only. Export is restricted. 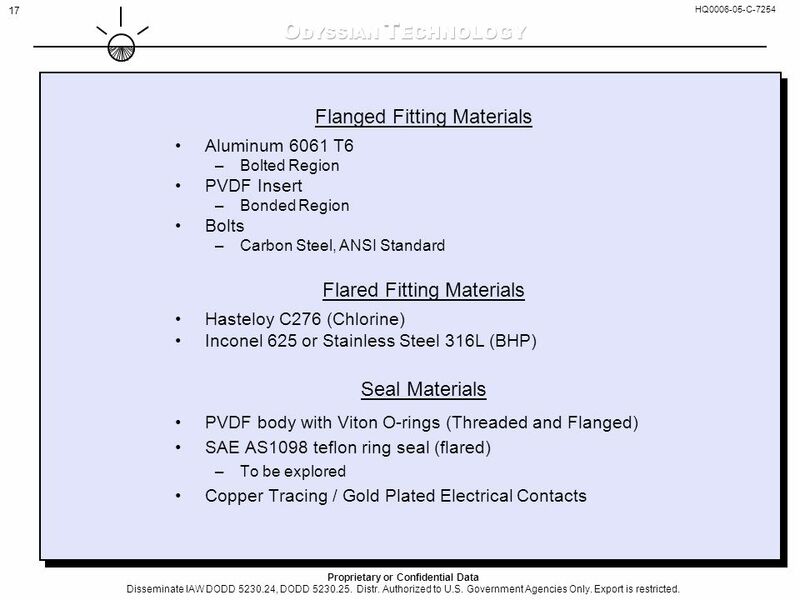 17 17 Flanged Fitting Materials Aluminum 6061 T6 –Bolted Region PVDF Insert –Bonded Region Bolts –Carbon Steel, ANSI Standard Flared Fitting Materials Hasteloy C276 (Chlorine) Inconel 625 or Stainless Steel 316L (BHP) Seal Materials PVDF body with Viton O-rings (Threaded and Flanged) SAE AS1098 teflon ring seal (flared) –To be explored Copper Tracing / Gold Plated Electrical Contacts HQ0006-05-C-7254 Proprietary or Confidential Data Disseminate IAW DODD 5230.24, DODD 5230.25. Distr. Authorized to U.S. Government Agencies Only. Export is restricted. 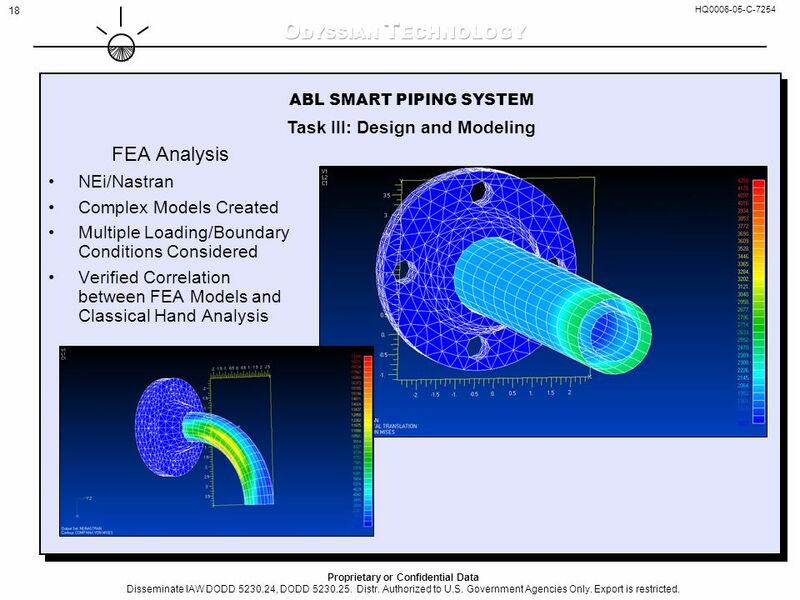 18 18 ABL SMART PIPING SYSTEM Task III: Design and Modeling FEA Analysis NEi/Nastran Complex Models Created Multiple Loading/Boundary Conditions Considered Verified Correlation between FEA Models and Classical Hand Analysis HQ0006-05-C-7254 Proprietary or Confidential Data Disseminate IAW DODD 5230.24, DODD 5230.25. Distr. Authorized to U.S. Government Agencies Only. Export is restricted. 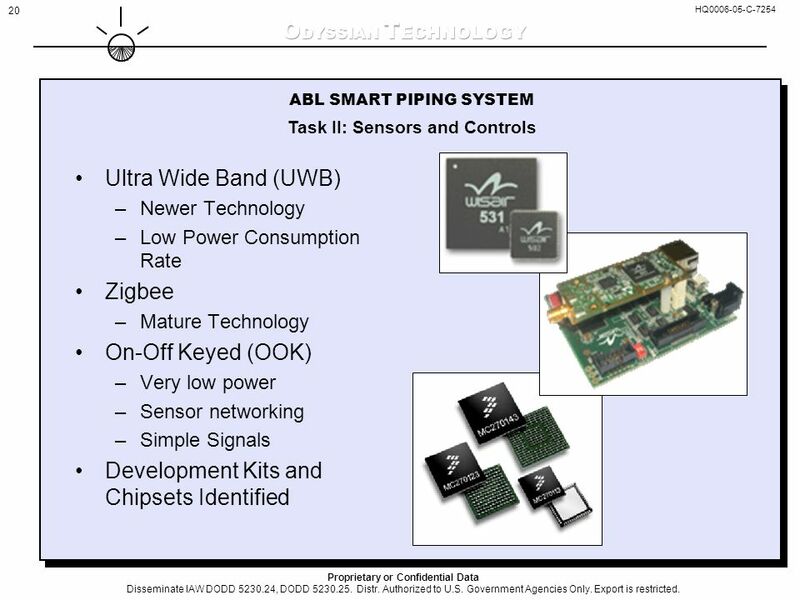 20 20 ABL SMART PIPING SYSTEM Task II: Sensors and Controls Ultra Wide Band (UWB) –Newer Technology –Low Power Consumption Rate Zigbee –Mature Technology On-Off Keyed (OOK) –Very low power –Sensor networking –Simple Signals Development Kits and Chipsets Identified HQ0006-05-C-7254 Proprietary or Confidential Data Disseminate IAW DODD 5230.24, DODD 5230.25. Distr. 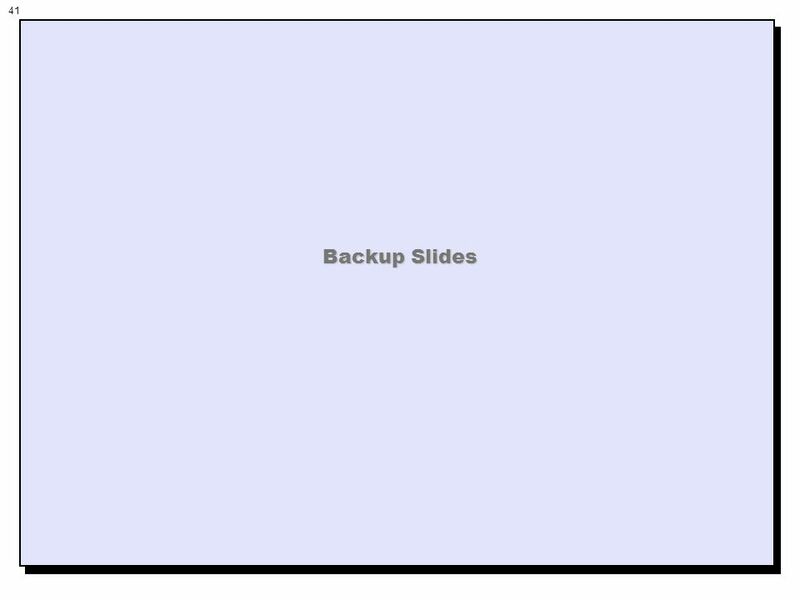 Authorized to U.S. Government Agencies Only. Export is restricted. 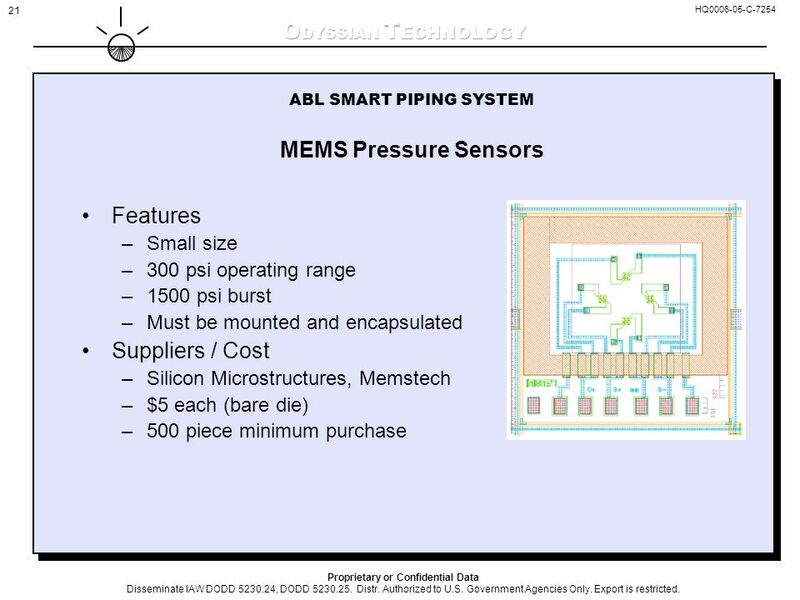 21 21 Features –Small size –300 psi operating range –1500 psi burst –Must be mounted and encapsulated Suppliers / Cost –Silicon Microstructures, Memstech –$5 each (bare die) –500 piece minimum purchase ABL SMART PIPING SYSTEM MEMS Pressure Sensors HQ0006-05-C-7254 Proprietary or Confidential Data Disseminate IAW DODD 5230.24, DODD 5230.25. Distr. Authorized to U.S. Government Agencies Only. Export is restricted. 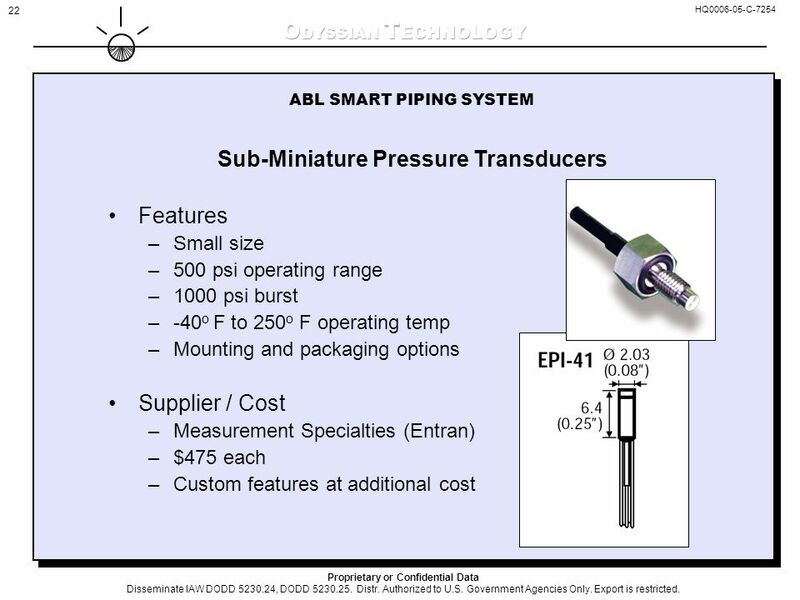 22 22 Features –Small size –500 psi operating range –1000 psi burst –-40 o F to 250 o F operating temp –Mounting and packaging options Supplier / Cost –Measurement Specialties (Entran) –$475 each –Custom features at additional cost ABL SMART PIPING SYSTEM Sub-Miniature Pressure Transducers HQ0006-05-C-7254 Proprietary or Confidential Data Disseminate IAW DODD 5230.24, DODD 5230.25. Distr. Authorized to U.S. Government Agencies Only. Export is restricted. 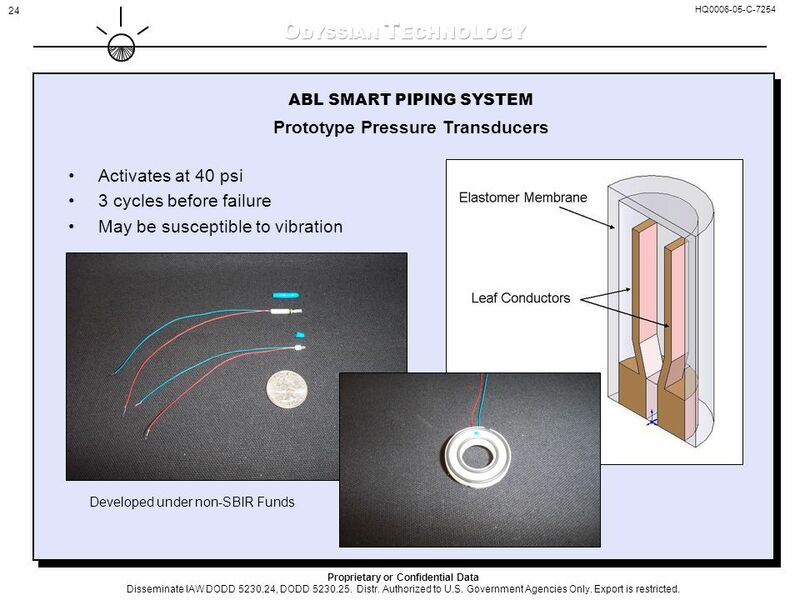 23 23 ABL SMART PIPING SYSTEM Prototype Pressure Transducers Activates at 75 psi 2-3 cycles before failure Simple design and materials Activates at 30 psi Unknown failure Simple design and materials Spring Contact Concept Diaphragm Concept HQ0006-05-C-7254 Proprietary or Confidential Data Disseminate IAW DODD 5230.24, DODD 5230.25. Distr. Authorized to U.S. Government Agencies Only. Export is restricted. 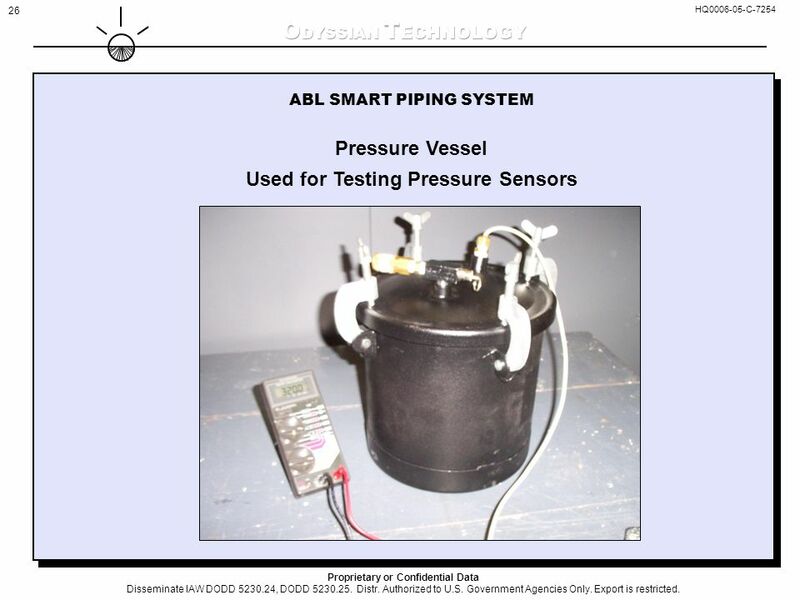 26 26 ABL SMART PIPING SYSTEM Pressure Vessel Used for Testing Pressure Sensors HQ0006-05-C-7254 Proprietary or Confidential Data Disseminate IAW DODD 5230.24, DODD 5230.25. Distr. Authorized to U.S. Government Agencies Only. Export is restricted. 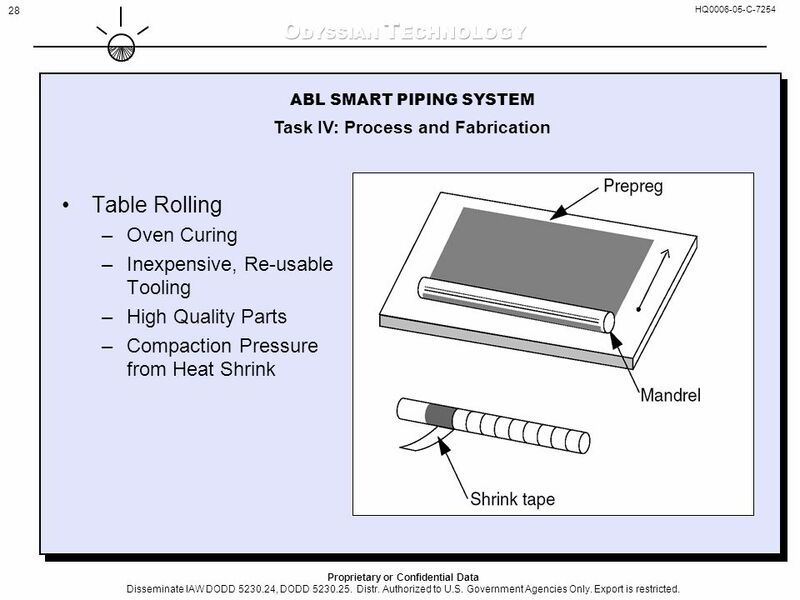 28 28 ABL SMART PIPING SYSTEM Task IV: Process and Fabrication Table Rolling –Oven Curing –Inexpensive, Re-usable Tooling –High Quality Parts –Compaction Pressure from Heat Shrink HQ0006-05-C-7254 Proprietary or Confidential Data Disseminate IAW DODD 5230.24, DODD 5230.25. Distr. Authorized to U.S. Government Agencies Only. Export is restricted. 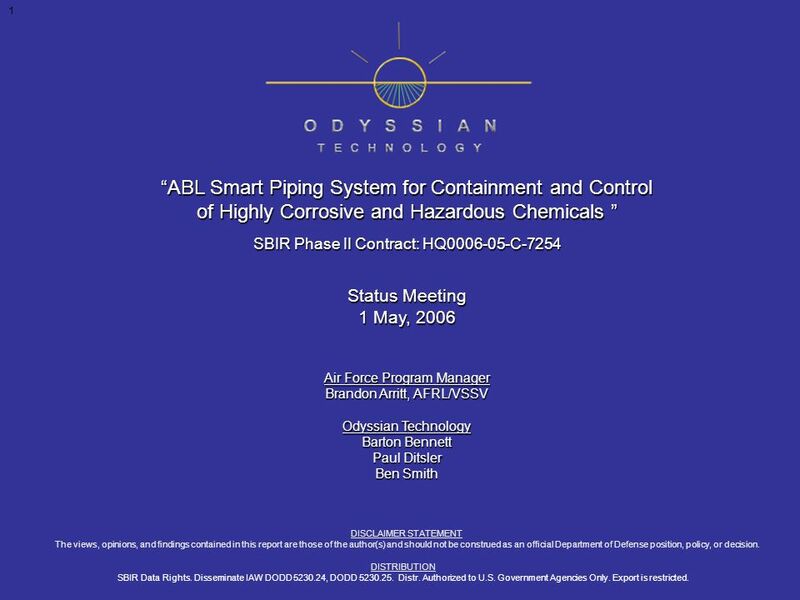 29 29 ABL SMART PIPING SYSTEM Table Rolling Process HQ0006-05-C-7254 Proprietary or Confidential Data Disseminate IAW DODD 5230.24, DODD 5230.25. Distr. Authorized to U.S. Government Agencies Only. Export is restricted. 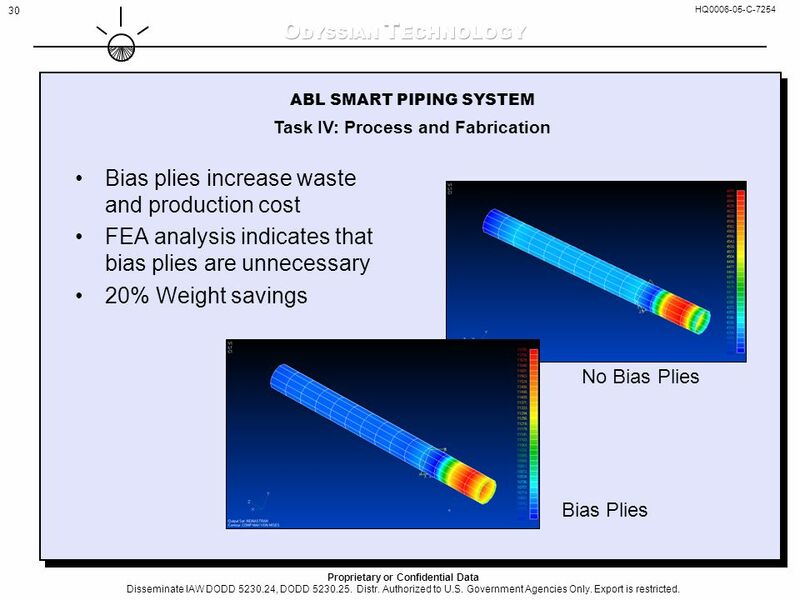 30 30 ABL SMART PIPING SYSTEM Task IV: Process and Fabrication Bias plies increase waste and production cost FEA analysis indicates that bias plies are unnecessary 20% Weight savings No Bias Plies Bias Plies HQ0006-05-C-7254 Proprietary or Confidential Data Disseminate IAW DODD 5230.24, DODD 5230.25. Distr. Authorized to U.S. Government Agencies Only. Export is restricted. 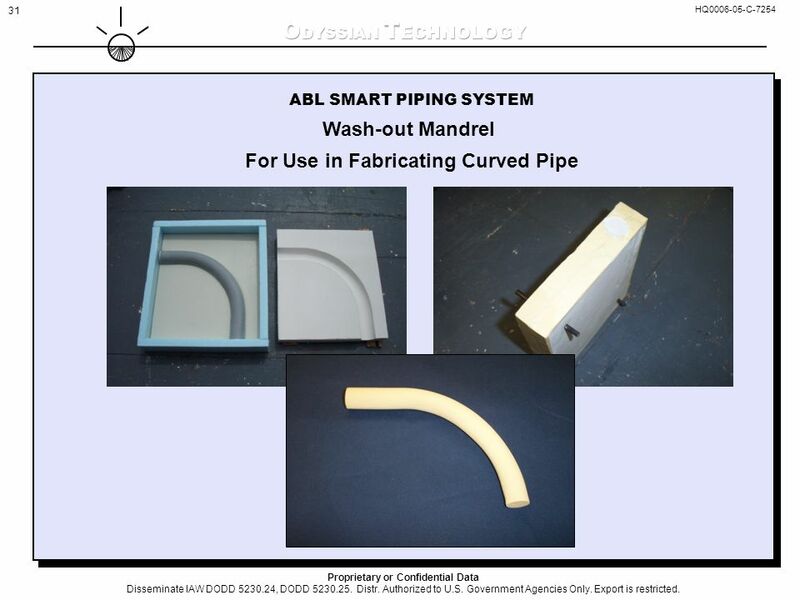 31 31 ABL SMART PIPING SYSTEM Wash-out Mandrel For Use in Fabricating Curved Pipe HQ0006-05-C-7254 Proprietary or Confidential Data Disseminate IAW DODD 5230.24, DODD 5230.25. Distr. Authorized to U.S. Government Agencies Only. Export is restricted. 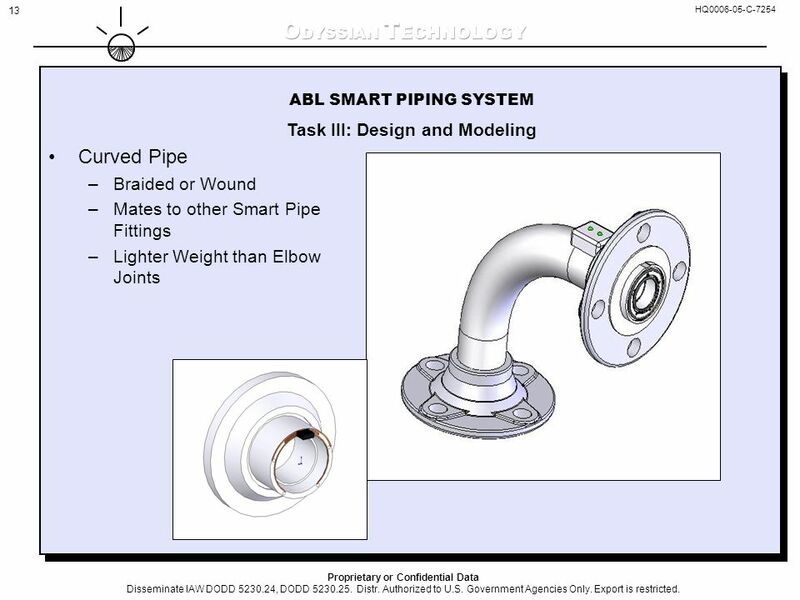 32 32 ABL SMART PIPING SYSTEM Curved Pipe Process HQ0006-05-C-7254 Proprietary or Confidential Data Disseminate IAW DODD 5230.24, DODD 5230.25. Distr. Authorized to U.S. Government Agencies Only. Export is restricted. 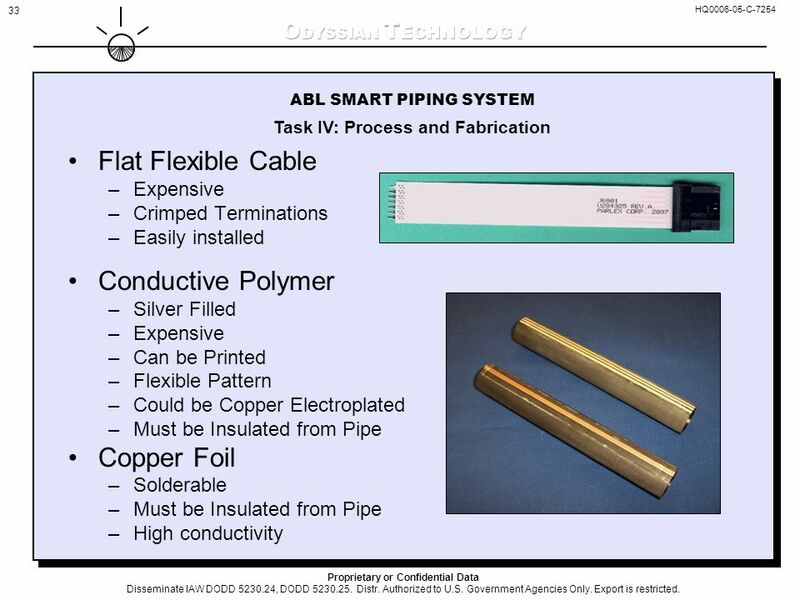 33 33 ABL SMART PIPING SYSTEM Task IV: Process and Fabrication Flat Flexible Cable –Expensive –Crimped Terminations –Easily installed Conductive Polymer –Silver Filled –Expensive –Can be Printed –Flexible Pattern –Could be Copper Electroplated –Must be Insulated from Pipe Copper Foil –Solderable –Must be Insulated from Pipe –High conductivity HQ0006-05-C-7254 Proprietary or Confidential Data Disseminate IAW DODD 5230.24, DODD 5230.25. Distr. Authorized to U.S. Government Agencies Only. Export is restricted. 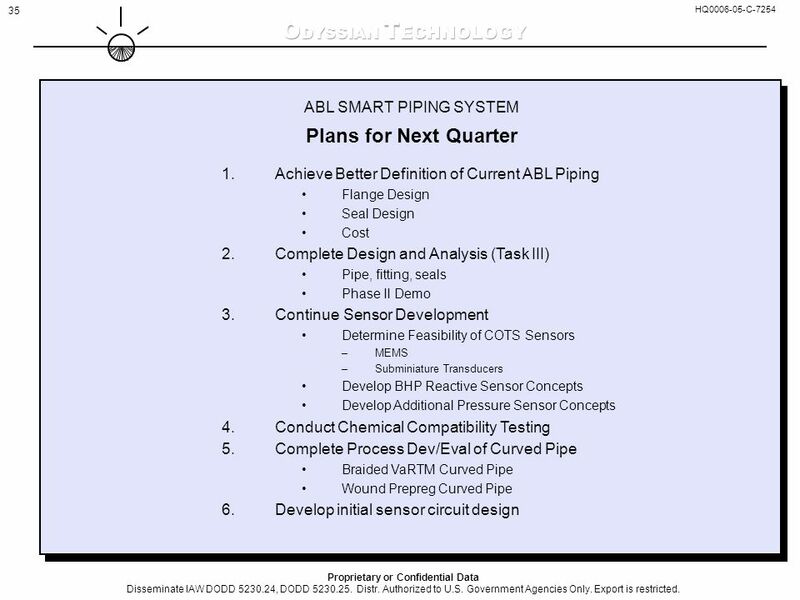 35 35 ABL SMART PIPING SYSTEM Plans for Next Quarter HQ0006-05-C-7254 1.Achieve Better Definition of Current ABL Piping Flange Design Seal Design Cost 2.Complete Design and Analysis (Task III) Pipe, fitting, seals Phase II Demo 3.Continue Sensor Development Determine Feasibility of COTS Sensors –MEMS –Subminiature Transducers Develop BHP Reactive Sensor Concepts Develop Additional Pressure Sensor Concepts 4.Conduct Chemical Compatibility Testing 5.Complete Process Dev/Eval of Curved Pipe Braided VaRTM Curved Pipe Wound Prepreg Curved Pipe 6.Develop initial sensor circuit design Proprietary or Confidential Data Disseminate IAW DODD 5230.24, DODD 5230.25. Distr. Authorized to U.S. Government Agencies Only. Export is restricted. 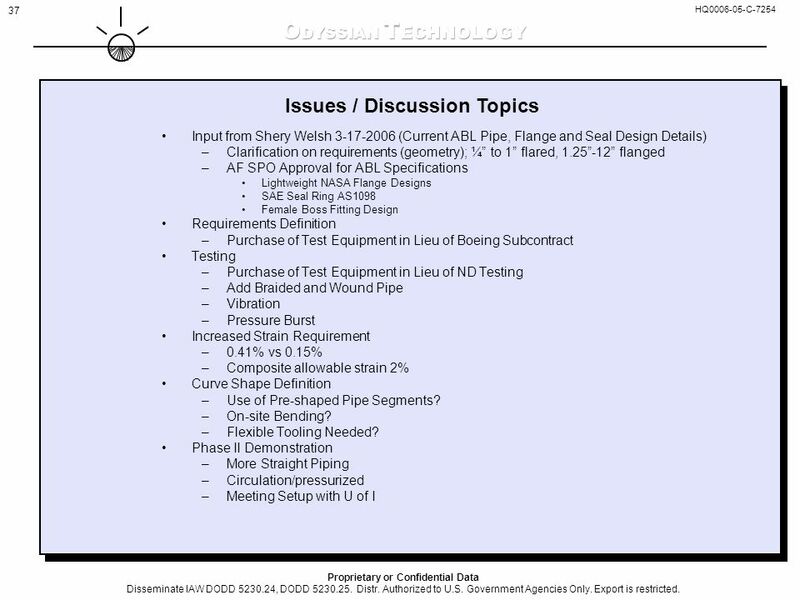 37 37 Issues / Discussion Topics Input from Shery Welsh 3-17-2006 (Current ABL Pipe, Flange and Seal Design Details) –Clarification on requirements (geometry); ¼ to 1 flared, 1.25-12 flanged –AF SPO Approval for ABL Specifications Lightweight NASA Flange Designs SAE Seal Ring AS1098 Female Boss Fitting Design Requirements Definition –Purchase of Test Equipment in Lieu of Boeing Subcontract Testing –Purchase of Test Equipment in Lieu of ND Testing –Add Braided and Wound Pipe –Vibration –Pressure Burst Increased Strain Requirement –0.41% vs 0.15% –Composite allowable strain 2% Curve Shape Definition –Use of Pre-shaped Pipe Segments? 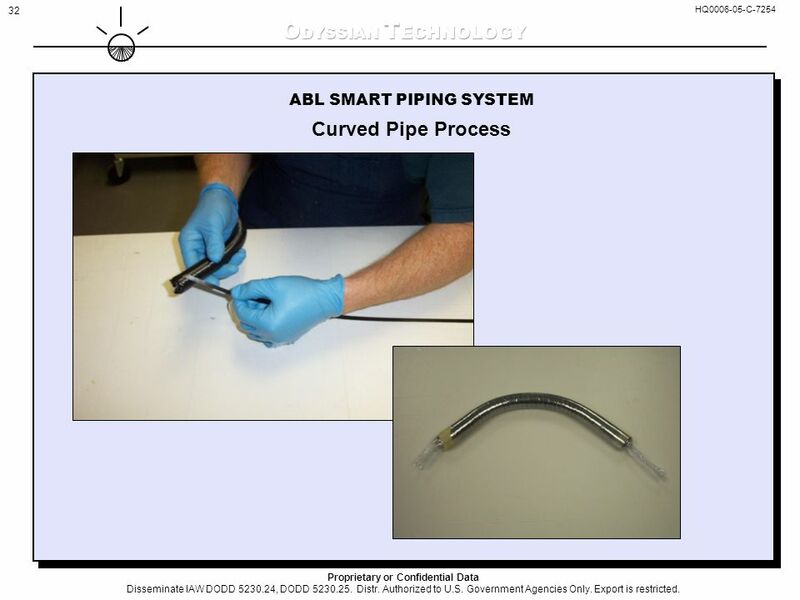 –On-site Bending? 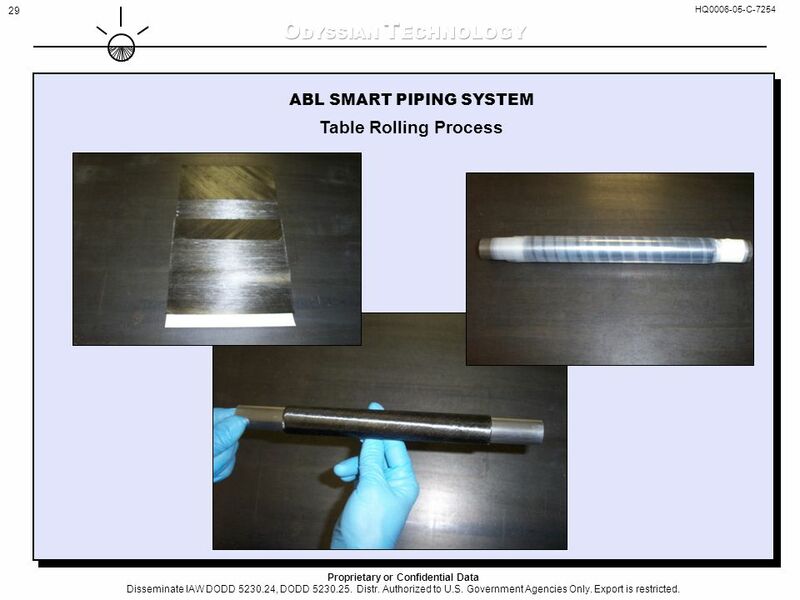 –Flexible Tooling Needed? 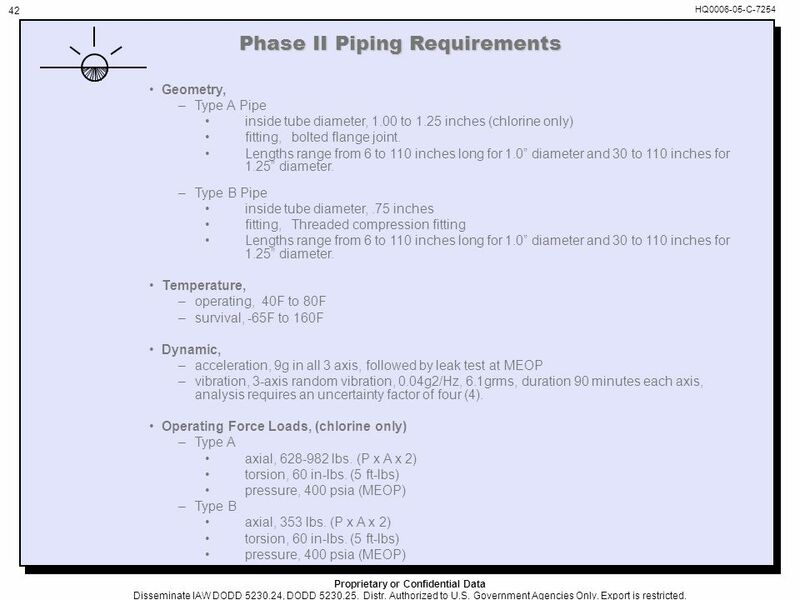 Phase II Demonstration –More Straight Piping –Circulation/pressurized –Meeting Setup with U of I HQ0006-05-C-7254 Proprietary or Confidential Data Disseminate IAW DODD 5230.24, DODD 5230.25. Distr. Authorized to U.S. Government Agencies Only. Export is restricted. 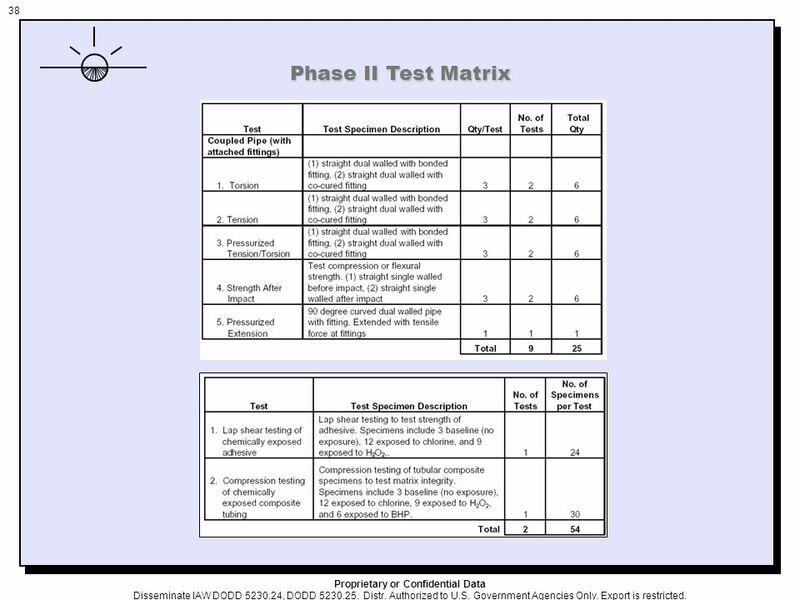 38 38 Phase II Test Matrix Proprietary or Confidential Data Disseminate IAW DODD 5230.24, DODD 5230.25. Distr. Authorized to U.S. Government Agencies Only. Export is restricted. 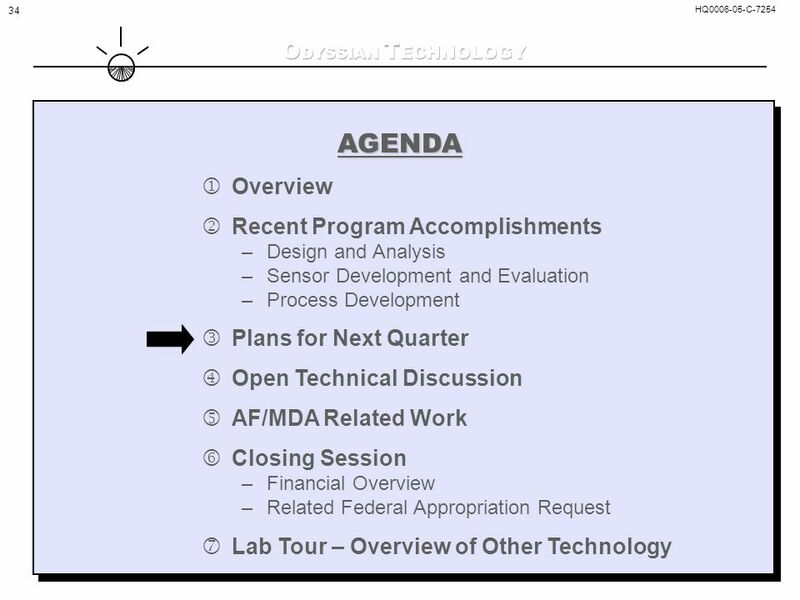 Download ppt "1 DISTRIBUTION SBIR Data Rights. Disseminate IAW DODD 5230.24, DODD 5230.25. Distr. Authorized to U.S. Government Agencies Only. Export is restricted." 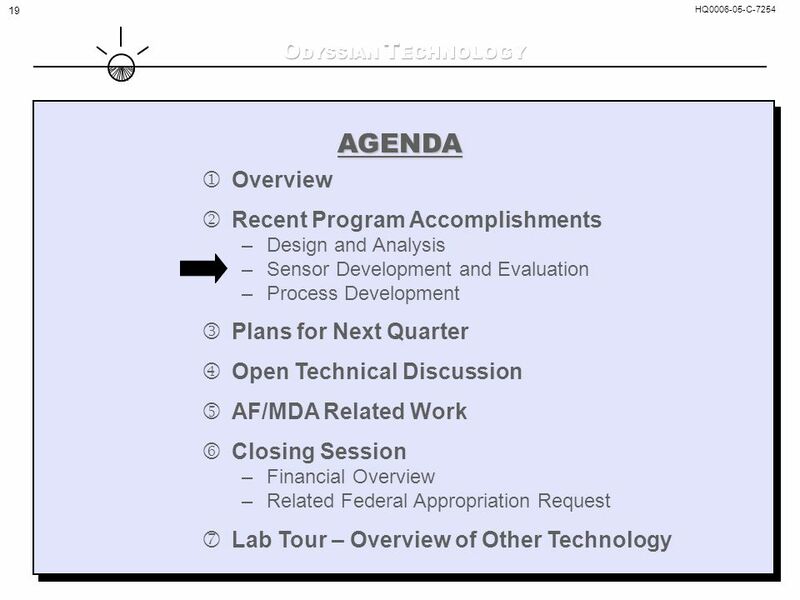 FIGURE 5.1 Potentiometric displacement sensor. 1 RA III - Regional Training Seminar on CLIMAT&CLIMAT TEMP Reporting Buenos Aires, Argentina, 25 – 27 October 2006 Status of observing programmes in RA.